Less than 1% of of the PCs expected to be in use globally in 2016 will be powerful enough to run the best virtual reality technology, graphics-chip company Nvidia has said. 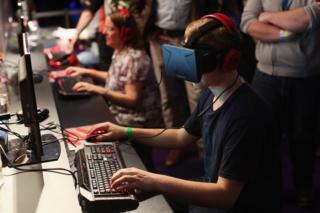 Consumers can access VR on smartphones and consoles, but need PCs to use high-end headsets such as the Oculus Rift. Some forecasts have suggested 2016 could be the year VR finally takes off. VR headsets create immersive 3D environments wearers can interact with and explore. But despite growing excitement about their potential, they have yet to reach a wider consumer audience. However, providers such as Facebook's Oculus and HTC are preparing to ship their first headsets by spring. And VR companies feature prominently at the 2016 Consumer Electronics Show (CES), which opens in Las Vegas on Monday. But Jason Paul, general manager of Nvidia's VR business unit, said most computers required a "sevenfold increase in raw performance" to work properly with the best headsets. "Delivering VR is a complex challenge," he told Bloomberg. "Immersive VR requires seven times the graphics processing power compared to traditional 3D applications and games." This is because below-par processing can lead to jerky, unsatisfying images. Oculus recommends owners of its Rift device have a PC with a powerful graphics card, such as the Nvidia GeForce 970 or AMD Radeon 290. They also need an Intel i5-class processor, more than 8GB of memory, and two USB 3.0 ports - all of which pushes up the price of a PC considerably. Chris Hall, editor at Pocket-lint.com, told the BBC: "For many households, the recent trend for PCs has been power efficiency and reduction in size for greater mobility, meaning they may not have the power for the best VR experiences." He added: "PC gamers may have the power, but for the casual VR user, that might mean a hefty investment if they want to adopt the first wave of new consumer VR products." But Rock, Paper, Shotgun editor Jeremy Laird told the BBC: "Very high-end cards or PCs are already pretty good for VR. "So something like an Nvidia GeForce GTX 980 is probably reasonably VR capable. "By the end of 2016, that kind of performance should be a lot more affordable as the next generation of graphics cards is phased in." Research company IHS has estimated seven million VR headsets will be in use by the end of 2016. And Facebook chief executive Mark Zuckerberg said in November he expected the VR market would "take a while to pick up momentum". While the company expects to ship the first orders of the Oculus Rift headset in March, it last week delayed the release of its Touch controller until the second quarter. Initial orders will come with an Xbox One wireless controller instead.